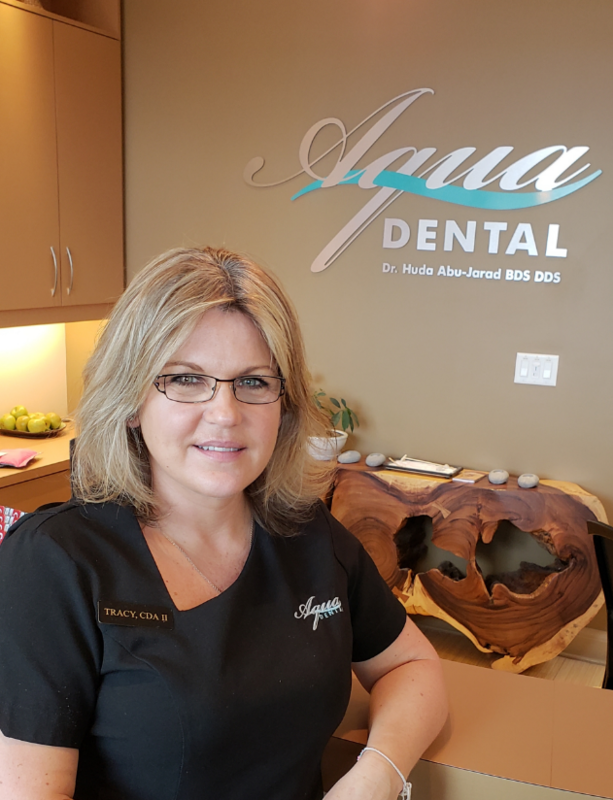 Aqua Dental aims to provide individuals with a comfortable and relaxing environment where we strive to exceed your expectations through professional results and our friendly staff. 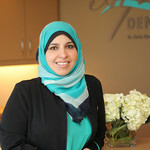 Dr. Huda is best known for her kind and gentle manner to both her patients and her staff. She earned her Doctor of Dental Surgery (DDS ) Degree from the University of Alberta in 2005 . Prior to that, she had completed her Bachelor of Dental Surgery in Jordan in 2000 ( Ranked Second in her class ) , In addition to a one year residency at Dammam Central Hospital the following year. Upon graduation, Dr. Huda worked in Sioux Lookout, Ontario for two years. She provided much needed dental service within the Sioux Lookout Dental Clinic, the O.R. program in the community hospital and to some 25 isolated First Nation communities. 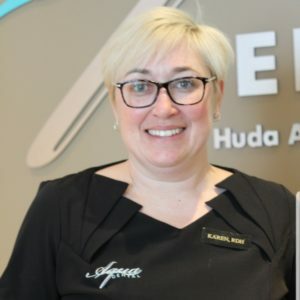 In addition to this, she was dedicated and very keen on providing the students of Pelican Falls High School (a boarding school) with comprehensive dental care before they went back home to their northern communities, an effort that required her presence at the school full-time one week each month. Huda obtained hospital privileges at the Meno Ya Win Health Centre in Sioux Lookout treating pediatric and senior patients under general anesthesia. Huda’s experience up north proved to her first hand how one bad dental experience can traumatize a child for life. 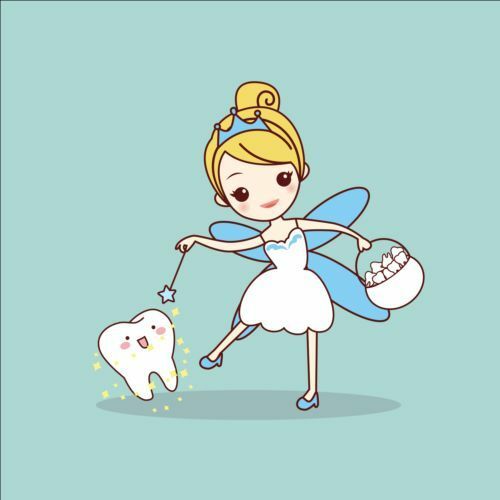 Therefore, children’s experiences in her dental chair are of the utmost importance to her. 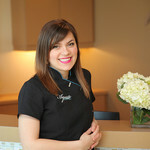 Her passion for dentistry is enhanced by her gentle and professional chair side manner which puts her patients at ease. Dr. Huda practices dentistry with integrity and knowledge and is committed on providing the highest quality of dental care to her patients ( in the most conservative way ) while remaining sensitive to their fears and concerns. The majority of Dr. Huda’s patients have been by word of mouth and referral by her committed patients (Thank you). Dr.Huda has two little girls ( Jenna and Leila ), If she is not in the office or at a course you will find her cuddling with them. Due to her strong family values , Dr.Huda understands how your time is precious. Therefore, she will do her absolute best to see you on time, and treat you and your family the way she would like her own family to be treated. She is endlessly involved in continuing education to better serve her family of patients. Cindy is best known for her light and fun personality which brings a lot of life in to the office. 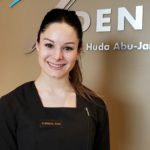 She completed her Dental assisting education at Algonquin College in 2006- earning the Ottawa Dental Society award of recognition for outstanding clinical and academic skills. 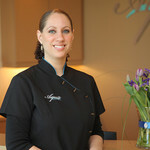 She then returned to Algonquin College to complete her Dental Hygiene education in 2009. She was the recipient of the coveted “Golden Scaler” award for outstanding clinical skills. She recently completed her Restorative hygiene certificate in 2015 at Algonquin as well. This allows her to play a role with Dr. huda in completing restorative fillings. She continues to be actively involved as an Algonquin alumna by being part of the Dental Program Advisory Committee. Cindy is endlessly involved in other continuing education such as new orthodontic treatment techniques and the most current periodontal procedures. She strives to deliver her patients the best clinical care possible as well as focusing on patient education and ensuring patient comfort along the way. 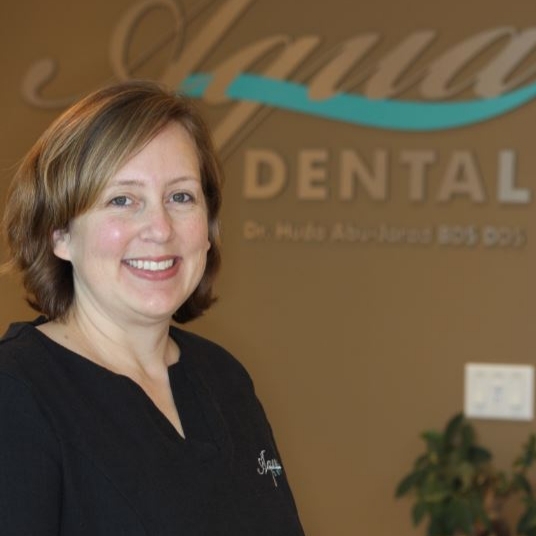 She is a member of the Canadian Dental Hygiene Association as well as the Ottawa Dental Society. Cindy is also a mom to a 5 year old beautiful girl and a 3 year old adorable boy. 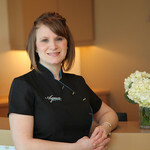 She has strong family values and loves working with children and hopes to create positive dental memories. I’m Ashleigh, I’ve been with Aqua since October 2014. I take a lot of pride in providing a positive and fun dental experience! I bring a very outgoing personality to our appointments together and love getting to know you! I treat all patients based on their individual needs, I feel that it is important to establish a great rapport, giving you the confidence you need for us to work together to better your dental health! I graduated from the Canadian National Institute of Health (CNIH) in March 2014. I am the proud recipient of the Canadian Dental Hygiene award, which awards you for outstanding scholastics, leadership and clinical skills. I was the chair of the student committee and student representative for my graduating class. When I am not at Aqua Dental, you can catch me spending time with my husband and cuddling my pets. I love to catch up on a great book or spend time planning my next big trip! I look forward to meeting you and your family at our next appointment together! Hi, I’m Karen. I’ve been with Aqua Dental since 2015. 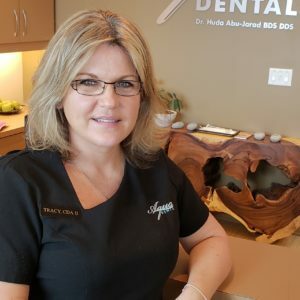 I graduated from Algonquin College in 1993 as a Dental Assistant and returned to Algonquin College in 2007 for Dental Hygiene and graduated with Honours in 2007. I enjoy meeting new people and love to laugh and am always wanting to make your dental experience enjoyable. I’m constantly learning new ways to bring the most current information to provide you with best and most informative appointment possible. When I’m not at Aqua Dental, I’m the busy Mom of two teens one who is almost ready to leave the nest and one who plays competitive hockey. My husband and I love to travel especially on his motorcycle, take in concerts and sporting events of all kinds. Hi there, my name is Kim. I have been a dental assistant for 9 wonderful, funfilled years. I graduated from Career Canada in 2004 with honours and kept myself current with the lastest technologies and advancements in our ever progressing field, by attending workshops and courses. I am a proud member of the Ontario Dental Assistants Association, as well as the Canadian Dental Assistants Association. I am very happy to work in an office that focuses on optimum patient care, has strong values, ethics and outstanding teamwork. Aqua Dental is passionate about patient comfort and care, as well as encouraging staff to reach their full potential and to continue their education, by attending courses. My sense of humour and empathic personality assures patients to feel comfortable and relaxed. Outside of work, my main focus is my 11 year old son, husband and numerous pets, including a squirrel who is very adamant that he too, is part of our family. Hello, my name is Tracy. I have enjoyed working in the Dental field since graduating from the Dental Assisting Program at Algonquin College in 1992. I continued with the Level II Assisting Program in 1994 with a Diploma from Western University. 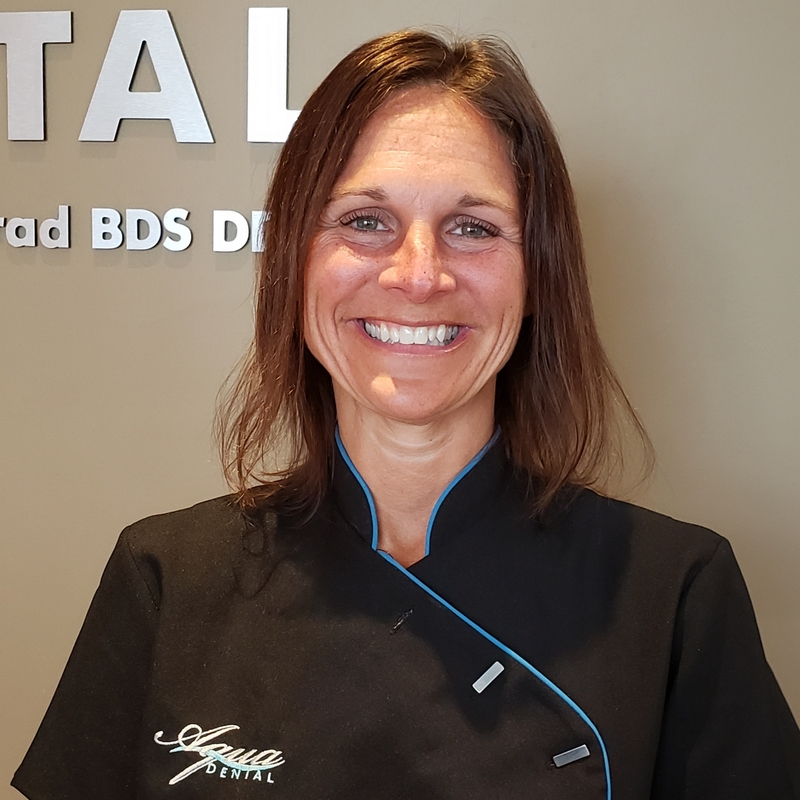 Having returned to the Dental field 3 years ago, after taking some time off to raise my children, I am thrilled to be a part of the Aqua Dental Team, with their warm, caring approach to patient care and friendly staff. Since joining the team in May 2017, I have had the pleasure of working with the many wonderful people in the community and looking forward to meeting many more! Hi, my name is Tracy. I graduated from Cambrian college in Sudbury in 1992 and I later went to Algonquin college to complete the level 2 assisting program. 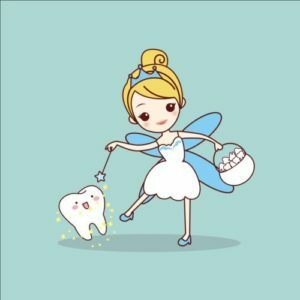 I worked as a dental assistant for 10 years then I left the dental field to be home with my family and did home daycare for 10 years all the while continuing my dental education over the years. I returned to the dental field 5 years ago and continue to be a member of the Ontario dental assistants association and Canadian dental association. 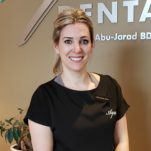 I am the newest member of Aqua dental (October 2017) and I was fortunate to find such a great friendly team who are passionate about their patients comfort and education. In my spare time I enjoy biking, baking and spending time with my husband and my 3 teenage boys. Over the years I have volunteered at soccer, cross country skiing and sprint kayaking events. Hi! My name is Tanya. I have been in the dental field since 1997. I graduated from college in Halifax, Nova Scotia but I am a true Cape Bretoner through and through! I worked as a Dental Assistant for the first 10 years and the remainder as a Dental Administrator. My transition to becoming a Dental Administrator has allowed me to develop stronger relationships with our patients. I really enjoy getting to know you and your family. I am also here to help you begin the process of becoming a patient at our clinic. I look forward to hearing from you! In my spare time, I love spending time with my family. I have two beautiful children, Emma and Carter, who are my pride and joy! I also enjoy volunteering for my son’s hockey team, snow mobiling and when the weather permits, motorcycling. I’m a member of the Ontario Dental Assistants Association as well as the Canadian Dental Assistants Association. I attend Continuing Education courses throughout the year so I can continue to gain more knowledge about dentistry. I graduated from the certified dental assisting program through Career Canada College in 1993. Immediately after graduation, I began working in orthodontics. Several years later I began doing office reception/management and this is where I felt I would excel.